Paris – October 26 2016 – Pydio, a popular Open Source sync & share platform, has announced the release of Pydio 7. This release provides improved team collaboration, by including LibreOffice Online functionality created by Collabora Productivity, the driving force behind putting LibreOffice in the cloud. 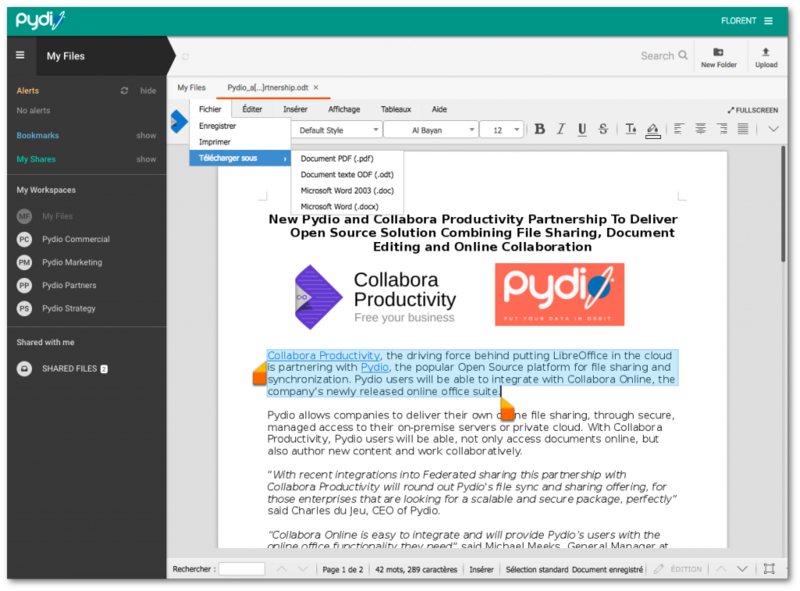 With Collabora Online, the powerful LibreOffice-based online office suite, Pydio users can now easily create, access and collaborate on office documents, directly from the browser, without the use any third-party services. Apart from the new Online Office Suite with Collabora Online, Pydio 7 also includes increased performances with Pydio Booster, increased Security with File Gateway™, Cross-Workspace Search, easy monitoring for admins and many under-the-hood improvements. Collabora Online in Pydio is available for enterprise deployments and community edition home users. For more information about this release, or an online demo, please contact sales@pydio.com or sales@collaboraoffice.com.